This article originally appeared in the August 21 issue of The Wareham Courier. BUZZARDS BAY - A spaceman, some pirates and a Grammy nominee walked into a ballroom… It’s not joke. All three and more turned out Aug. 15 to support the National Marine Life Center at the annual Mermaid Ball. The evening featured dinner, drinks and an auction. “The National Marine Life Center has faced a year of tremendous challenges and opportunities,” NMLC Executive Director Kathy Zagzebski said. The greatest challenge came when a portion of the center’s roof collapsed, shuttering its on-site rehabilitation program. Zagzebski said the collapse was a cloud with a bright silver lining, since the demolition of the old building would pave the way for an improved facility that would incorporate better space for staff and patients alike and allow for additional upgrades to take in much more diverse wanderers than turtles and seals. The new building will take advantage of another construction project, the life support building, that the center started over the past year, The building will pump clean salt water straight from the canal into the center to maintain a constant supply of water without having to rely on trucking. Those construction projects, as well as the center’s continuing missions of education and rehabilitation, all add up and keeps the staff busy writing grants when they’re not working to make the world a better place one turtle at a time. 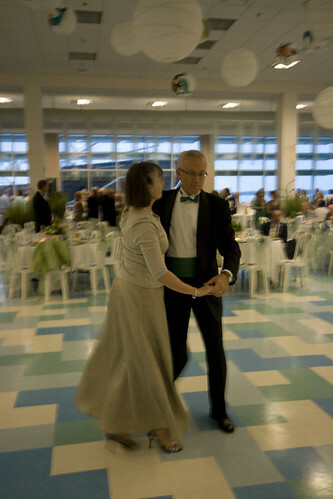 At the ball, though, it wasn’t just about the work put in at the Marine Life Center. This year the trustees inaugurated an award in memory of one of the center’s founding benefactors, Townsend Horner. The Townsend Horner Environmental Stewardship Award highlights the actions and activism on behalf of the earth, whether it’s on the land or in the sea. Former Red Sox pitcher Bill “Spaceman” Lee, who will be inducted into the Red Sox Hall of Fame in October for his accomplishments on the mound, received the first award.In his 1984 memoir, he wrote that there was the Bill Lee of the mound and the Bill Lee of the world. The former was gripped by a competitive spirit that was always out to win, while the latter was someone who tried to care as much about the earth and its inhabitants as himself. In addition to the award, Lee received a special jersey proudly bearing the number “1.” The jersey helped get the bidding going at the auction, when Lee took it right off his back and signed it for the winner. Singer/songwriter Sophie B. Hawkins wasn’t quite sure what she was being honored for, or what great step she had taken on behalf of the earth. Robert Brennan, vice chairman of the center’s board of trustees, said that it wasn’t just for recycling cling wrap or starring in a National Wildlife Fund documentary to raise awareness about the plight of the Kemp’s Ridley sea turtle; it was the distance covered by all those steps and the example they set. “We are all activists and we are all architects of our own destinies and of the earth’s destiny,” Hawkins said. She approached the award with humility, noting that everyone had an important role to play in making the world a better place, and that everyone could join in this creative process to protect the earth. She said protecting the earth was about taking the little steps and being vigilant about them. She was optimistic about America’s potential to catch up to other countries in fighting on behalf of the environment. “The thing about Americans is that every time America gets the truth, we respond instantly and we change and take it a thousand steps further. I love that,” she said. Hawkins also performed some of her old songs and her new single, “The land, the sea, the sky.” Also helping get people onto the dance floor for the evening was the band Four Guys in Tuxes, which performed an array of standards and songs with a big band swing. The attention and effort by the staff and students of the Massachusetts Maritime Academy added to the atmosphere of formality and frivolity. For more information about what’s going on at the National Marine Life Center, visit its Web site at www.nmlc.org. Mermaid Ball 2008 from Wareham Courier on Vimeo.